We feature Authentic Native American made Peace Pipes. We present 3 artist and several styles to choose from. We are caught up on orders and orders are currently shipping in 1 to 2 days from date placed! This is a collection of Very unique Pipes by Lavern Little. Lavern is a featured artist and is Dakota Sioux. Lavern hand paints his feathers and they have become a trademark of his peace pipes. He often usually has a medicine pouch or Leather wrapped wheel as additional trim. 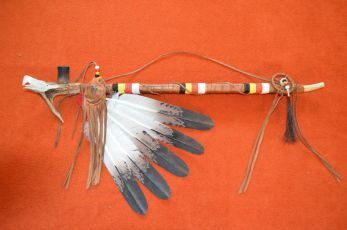 These peace pipes are between 18 and 19 inches long. They are constructed with hand wrapped leather, beadwork, and Rabbit fur. Cut deer antler is used for for the bowl. This is a collection of very unique Pipes by Lavern Little. Lavern is a featured artist and is Dakota Sioux. Lavern hand paints his feathers and they have become a trademark of his peace pipes. These pipes use Full antler points sometimes as many as 4 are used in these pipes. $210-$300 and up peace pipes. This is a collection of Larger Pipes Lavern Little. He often usually has a medicine pouch or Leather wrapped wheel as additional trim on these pipes, and often uses Eagle claw and hand carved eagle heads in the bowls. Laverne is a featured artist and is Dakota Sioux. 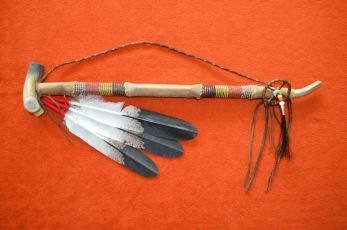 Lavern hand paints his feathers and they have become a trademark of his peace pipes. They are usually over 24" long. 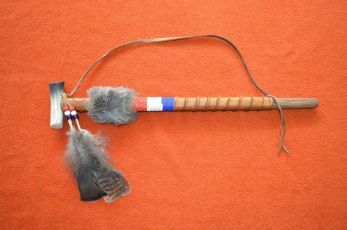 Peace Pipes are also called Calumets.